We have created an original product thinking about the comfort and safety of your baby. Manufactured with 100% natural products to protect your baby's health from microbes, fungi and allergies. Specially designed with ergonomic features, to help your newborn to naturally develop his head, avoiding the flat head toddle syndrome, your baby's head will fall into the center and he will have a beautiful head, also keep your baby's spine in the correct alignment. Ensuring the correct position of your newborn during sleep, reduce the acid reflux, colic, that assure their proper rest. Our baby pillows are made of 100% natural cotton, this allows us to offer a product with a high degree of freshness, the cottons allow the air to flow freely, in addition, it is a dermatologically tested tissue, which attenuates and helps to prevent the risks of irritations, itching, infections and allergies. The cotton is soft and pleasant to the touch that provides maximum protection to the skin. The cotton garments are very resistant and durable; they support very well the continuous washing machine and supports high temperatures. The toddler pillows are filled with natural latex obtained from rubber trees. The latex has great elasticity and strong support that translates into a very good adaptability; these two properties make our pillows a hard but flexible support, in addition, they have anti-bacterial properties and natural anti-fungi since it is not a suitable substrate for the growth of these organisms and the natural latex allows a good transpiration and freshness. The latex is not deformed, so, our pillow will always maintain their structure. The latex has a high durability, support very well the continuous washing machine. Ask your baby's doctor, perfect for newborn! The pillow is small and fits their little head perfectly. GUARANTEED 100% Satisfaction: If you are not completely satisfied at any time, for any reason, please let us know and we will fix it for you or/and we will give you a full refund. Please give us an opportunity to make it right for you. HEALTHY MATERIALS: ECO-Friendly 100% Natural Organic Cotton and Natural Latex obtained from rubber trees. This material attenuates and helps to prevent the risks of irritations, itching, infections and allergies. It makes our baby pillows natural and hypoallergenic. Ask your baby's doctor, perfect for newborn!!! The pillow is small and fits their little head perfectly. DESIGN: We have designed a pillow with shapes of animals to beautify the environment of your baby, while preventing flat head syndrome in your baby. The hole is just the right size. GREAT QUALITY. Our pillows has been elaborated and inspected individually ensuring a high quality. In addition, our materials no contain dyes, no bleaches, no printing, safe, natural materials, chemical free. COMFORT: Our toddler pillow are fresh and always maintain the structure and support so that your baby does not have problems with reflux or colic. Your baby will experience a pleasant sleeping. 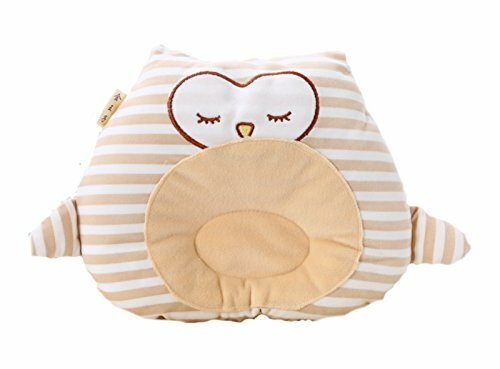 The pillow will makes your baby more comfortable and lets him sleep better, you baby won't longer wakes herself up from moving so much. If you have any questions about this product by HiGo Commerce, contact us by completing and submitting the form below. If you are looking for a specif part number, please include it with your message.